Congratulations Michelle! I will be sending you an email in just a few minutes which you will have to reply to quickly this time, with your name and full mailing address so that I can get your information to the people who will be sending you the Jack the Giant Slayer Combo Pack directly. 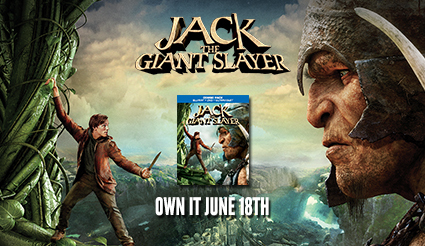 Warner Bros. is proud to announce the arrival of Jack the Giant Slayer released on DVD & Blu-ray on June 18! Unleashed on the Earth for the first time in centuries, the giants strive to reclaim the land they once lost, forcing Jack (Nicholas Hoult), into the battle of this life to stop them and rescue the princess! For more information please check my Disclosure Statement. Our giveaways are in no way sponsored or promoted by Facebook. I am a Courageous Warrior. It says I am a LION-HEARTED KNIGHT! I am also a Courageous Warrior! I am a Courageos Warrior! I am a Courageous Warrior! courageous warrior!! thanks so much! Ha - I am a Courageous Warrior, who would have thought. I was a Courageous Warrior. I'm a FUTURE COURAGEOUS WARRIOR! I am a mom of two boys - how can I not be brave???? I am a LION-HEARTED KNIGHT! I am a Lion-Hearted Knight!! I am a courageous warrior. Thanks for the chance! That was cute... I am a courageous warrior. I am a Lion Hearted Knight! The movie looks great. I am a lion-hearted knight.